Living with his grandparents on a tiny island off the Washington State coast, Zach feels cut off from the world. Especially when he's forbidden to chat with his online friends. But then his little brother, Gilbert, is kidnapped. To find him, Zach discovers how to astral project. Soon, his spirit is soaring through the strange and boundless astral realm—a shadow place. 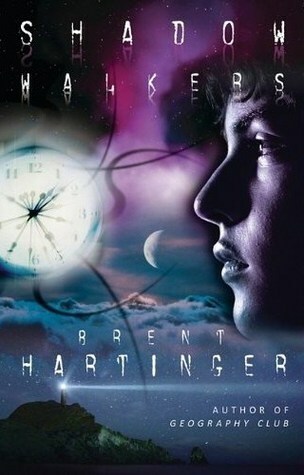 While searching for his brother, Zach meets a boy named Emory, another astral traveler who's intriguing (and cute). As they track the kidnappers from the astral realm, their bond grows—but each moment could be Gilbert's last. Even worse, there's a menacing, centuries-old creature in their midst that devours souls and possesses physical bodies. And it's hungry for Zach. What first drew me in to Shadow Walkers was the idea of astral projection. I would love nothing more than to be able to leave my physical body behind and just travel! Brent Hartinger hits the nail on the head with his explanation in this book. By the time I had finished reading, I'd say I had a pretty good handle on the concept. If you have ever wondered about astral projection, you'll find it simply fascinating. Truthfully though, other than the astral projection aspect, this book had a difficult time holding my attention. The characters are sweet enough. Zach has a good head on his shoulders, although he feels trapped on his island home. Emory is sincere and definitely meshes with Zach. However it was Gilbert that stole the show, let me tell you. This fireball of a little brother was so adorable! When he goes missing I seriously had a moment of panic. Such a cute little kid! The romance aspect of the book was also a nice addition. I thought it was fabulous that Brent Hartinger included a homosexual romance that wasn't angst driven or a social issue. It did fall a little flat for me though, mostly in the believability department. Although I enjoyed the fact that the boys were able to connect on such an otherworldly level, their relationship moved like lightning. I've heard of stress bringing people together, but even with my paranormal blinders on I had a hard time accepting that they would be so into one another in such a short time. Added on is a bit of a side story about an astral creature that tries to devour the souls floating in the astral realm. I liked this addition, but I so wished it was a little more drawn out and explained. It was genuinely interesting! It just happened to be overshadowed by everything else going on. I'd honestly have to say that my favorite part of the whole book was the mystery surrounding Gilbert's disappearance. I had no idea where that part of the story was going, and as Zach searched I genuinely worried. When your favorite character ends up missing, well that's just something that you end up worrying about. My final verdict on this book is that it is a sweet, short and unique read. Although it didn't sate my whole literary appetite, there was definitely enough there to keep me coming back! If Zach, Emory and Gilbert come back in a second book I'll be there to follow them on their adventures.